Playacar Phase 1, Playa del Carmen - This magnificent oceanfront villa is one of the most prestigious properties in the gated community of Playacar Phase 1. 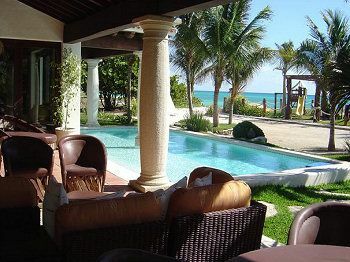 Casa Caribe sits 40 meters from the shore just behind it's own professionally landscaped beachfront lot. Selling price includes this lot thus insuring pristine Caribbean views forever! This fabulous home has been beautifully decorated is being sold fully furnished. The main house has 4 bedrooms, each with ensuite bathrooms, TV room and office that could easily be converted into another master suite, spacious gourmet kitchen with a pantry, dining room, living room, ocean view terraces, swimming pool, tropical green areas, carport with space for three vehicles and storage room. There is separate mother-in-law- suite with 2 bedrooms and baths. This home is equipped with air conditioning throughout, telephone lines and high speed internet. The home and the beachfront lot can be purchased together or separately. Please contact Rob@BuyPlaya.com for a private viewing of this exclusive home.